This issue of The Journal of Alternative Investments deals with three topics that have attracted significant attention recently. The first two articles focus on trend-following strategies. It is well-known that trend-following strategies have performed inconsistently since 2008 (Exhibit 1). Several explanations have been proposed to explain this lack of consistency in the performance of systematic Commodity Trading Advisors (CTAs). My favorite explanation is that systematic futures-based strategies rely on counterparties who are willing to systematically lose money and that these counterparties are no longer around—or at least fewer of them are around. Historically, these counterparties consisted of hedgers (i.e., producers and consumers of commodities) and unsophisticated traders. Although demand for hedging by producers and consumers might exist, they seemed to have changed their approach since 2008, and the availability of data and off-the-shelf trading algorithms has reduced the number of unsophisticated traders. In the first article, “Just a One-Trick Pony? 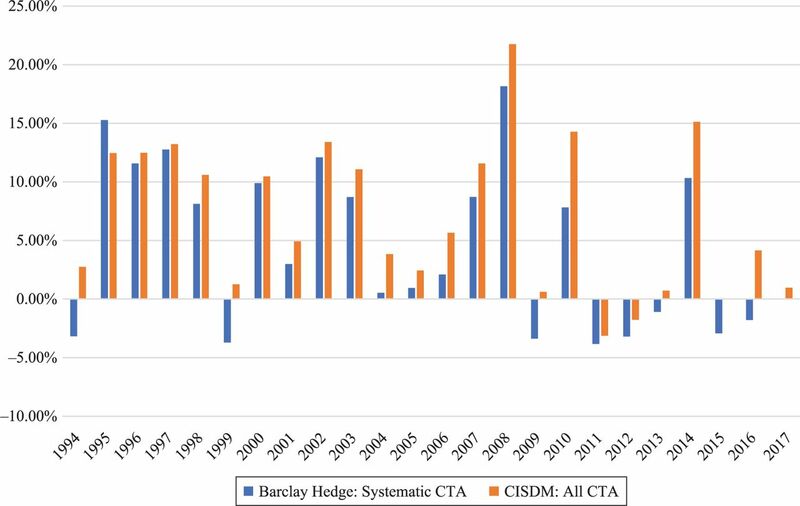 An Analysis of CTA Risk and Return,” Foran, Hutchinson, McCarthy, and O’Brien examine the performance characteristics of a large sample of CTAs to show that these private funds are not a homogenous group. They identify eight different CTA substrategies with very different sources of return and low correlation between substrategies. The implication is that although systematic trend-following strategies are the dominant form of trading among CTAs, there are many other strategies with their own specific sources of returns. As a result, alternative beta strategies that promise to offer CTA-like returns may disappoint investors. In “Uncovering Trend Rules,” Beekhuizen and Hallerbach examine well-known trend-following strategies based on moving averages (MAs). Conventionally, trend rules are based on the MAs of prices rather than returns, which obscures how much weight is assigned to different historical time periods. In this article, the authors show how to uncover the underlying historical return weights of price MAs and combinations of price MAs. This leads to surprising and useful insights about popular trend rules—for example, that some trend rules have inverted information decay (i.e., distant returns have more weight than recent ones) or hidden mean-reversion patterns. This opens the possibility for improving the trend rule by analyzing the added value of the mean-reversion segment. The second part of this issue deals with private equity and illiquid assets. In “Measuring Liquidity Premiums for Illiquid Assets,” Anson focuses on measuring the full amount of systematic risk embedded in the returns to private asset classes using a four-factor model. He demonstrates that a significant amount of systematic risk is embedded in the returns to private assets and constructs a liquidity premium index that is used to determine how much of the return to illiquid assets is from the liquidity premium and how much is from manager skill. The article reports that once the true amount of systematic risk liquidity premium is taken into account, the resulting alpha produced by private asset managers declines significantly. In “RATZ IRR: Performance Measurement in the Absence of Cash Flow Data,” Renkema, van den Goorbergh, and Garcia Rivas introduce a methodology to estimate the portfolio internal rate of return (IRR) from portfolio constituents when only the IRR and the money multiple of the constituents are available. This new methodology is called reconstructed average time zero (RATZ) IRR. Of course, the true IRR of the portfolio cannot be calculated because not all cash flow information is available. Therefore, the authors derive an analytical expression that shows the degree of approximation error between RATZ IRR and the portfolio’s true IRR. The authors provide empirical evidence of the quality of the estimator by using a proprietary dataset from a large private equity investor. The final section of this issue deals with volatility. In “VIX Christmas Effect,” Feldman and Jung point to an apparent anomaly in the U.S. stock market, in which the VIX trades systematically lower during the first 17 to 22 trading days of December. This is potentially due to a Christmas effect, in which trading activity slows before Christmas. The authors test this hypothesis using two approaches, one from the spot VIX and the other from the VIX futures term structure. In addition, the authors test the holiday explanation, according to which the VIX declines before holidays because trading activity declines. The authors discuss the trading implications of this anomaly. In the article titled “Commodity Returns and Their Volatility in Relation to Speculation: A Consistent Empirical Approach,” Haase, Seiler Zimmermann, and Zimmermann analyze the relationship between futures returns and their volatilities for 28 commodities for three maturities and three speculation proxies. Overall, they find a larger number of significant relationships between these proxies and volatilities but not returns—that is, increases in speculative activities increase return volatilities but not significant trends in prices. The results are not uniform, as the relationships display varying degrees of strength for different commodities.